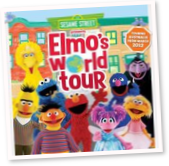 Come along with Elmo and the Sesame Street gang as they circle the globe in this all-singing, all-dancing stage show touring Australia in 2012. Abby Cadabby, Big Bird, Grover, Zoe, Cookie Monster and Elmo use the letters of the alphabet to navigate a voyage through imagination that sees the gang visiting China, Zambia, France, India and Australia! Elmo and his friends have fun learning how people sing and dance and say hello in different places, but things don’t go to plan when Cookie Monster eats a letter of the alphabet. Can Abby Cadabby find the right spell to help? Along the way, audiences will also delight in hearing a sensational tale from The Count and will help some back-packing rubber-duckies find a place to stay with Bert and Ernie. Featuring a bunch of classic Sesame Street songs alongside catchy new tunes, SESAME STREET PRESENTS ELMO’S WORLD TOUR will delight Sesame Street fans of ALL ages.